Executing a successful digital marketing strategy takes a lot of work and a lot of hands. When there are multiple people contributing to your overall strategy, it is essential to keep a close eye on your marketing budget and who is spending what, how, and when. 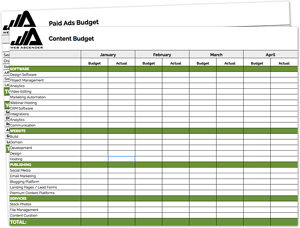 That's why we put together a comprehensive marketing budget template - so you can use one spreadsheet to keep your digital marketing budget organized and in one place for 2019. Fill out the form to download the budget template now!